The death rattle: The choice to take a dying patient off a ventilator brings with it the rattle, a sound Peskin likens to one "blowing air through a straw at the bottom of a cup of water." It's actually tied to swallowing, as the process to move our saliva out of our mouth but keep it out of our airway (via the epiglottis) misfires. Air hunger: Peskin defines this simply as "the uncomfortable feeling of breathing difficulty." She's less definitive about why it causes pain, but some research points to a hiccup between how fully our brain wants us to breathe and how well our lungs can actually inflate and deflate. Terminal agitation: This is a less typical occurrence and can make the body "appear tormented." Peskin writes that the dying patient's shouts or spasms can have physical causes (urine retention is one). I want to die with as the Cosmic Explosion I will release. I'm afraid to die alone! I don't understand why this was deemed newsworthy. Details of how people die is not NEWs and it preys on fear of dying to make a sensational "news" story. Is it helpful to enhance a person's fears without providing information about what can be done to provide comfort measures? I am a nurse and have been with several people when they died. Some have these symptoms, some did not. 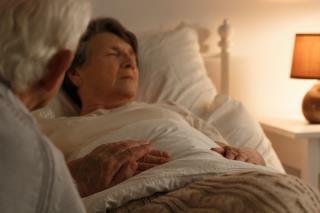 Hospice programs exist to make the process of leaving this world more comfortable and peaceful. They can teach family members how to help and provide comfort measures,like a way to suction secretions when someone cannot swallow, supplimental oxygen to keep up blood levels and medications to treat pain and aggitation. If you or a famiy member has a terminal diagnosis, ask your doctor for a referral for Hospice. You can meet with Hospice personnel to find out about the service and then decide if it is right for you. "Living Wills" ... they work for the living as well as the dying. Besides, who's death is it anyway, yours or theirs. Often for the living, its not the slow death of a loved one, its the inconvenience we incur sitting and watching it happen. Living wills can help resolve some of that ... check 'em out.